A Time Traveller workshop, an early bird booking period, and a new way of reserving school trips are some of the forthcoming highlights at LEGOLAND Windsor Resort, Berkshire in 2018. English, Geography, Business Studies and STEM subjects (Science, Technology, Engineering and Maths) will be covered in the 12 National Curriculum workshops available to school groups next year. A new workshops will be the LEGO Time Traveller workshop, available to Key Stage 1 and 2 pupils. This workshop ties in to History. At 45 minutes long, the session explores ancient civilisations from the Stone Age to Roman Britain. Pupils will discover how their characteristics and achievements have influenced modern Britain, with the help of a LEGO Time Line and an unlimited supply of LEGO Bricks. Up to 30 pupils at a time can participate in LEGO Time Traveller. The lesson objectives include understanding how modern Britain has been influenced by other civilisations; and to build and display an invention from an ancient civilisation on the LEGO® Time Line. Other workshops include Around the World in 80 Bricks, Underwater Creatures and Habitats, and the LEGO Education Story Starter session. 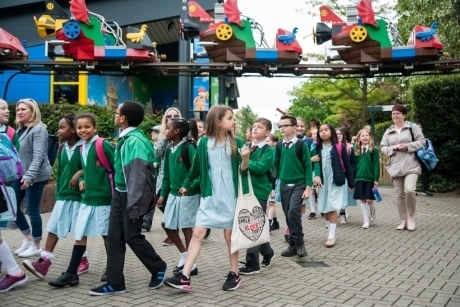 School bookings will now be handled differently with everything now available to book online rather than by calling the booking team – something the LEGOLAND team states will be a lot easier for teachers planning a visit. Teachers planning a trip to LEGOLAND soon can take advantage of a School Early Booking fee. It is £7.50 per student and valid up until the end of January. For more information visit www.LEGOLAND.co.uk/Schools.